The New Year is Almost Here... Time to Change Out Your Ratty Salon & Spa Towels! Replace Your Old Nasty Towels TODAY! I was getting a massage at a very nice day spa the other day and the therapist was using a rolled towel as a knee bolster. Was I disturbed because she did not use a traditional round or half-round bolster? No. I was disturbed because the towel she used looked old and disgusting. The edges were frayed and the white color was more like a dingy grey. This one tiny aspect of my treatment changed my thoughts about the entire establishment . My point is: if something looks old and gross in your spa or salon... CHANGE IT. CHANGE IT NOW. Towels are one of those things that start to look bad over time... even good towels. Is it worth losing a client and all their referrals forever because you had some nasty towels? No, of course not. 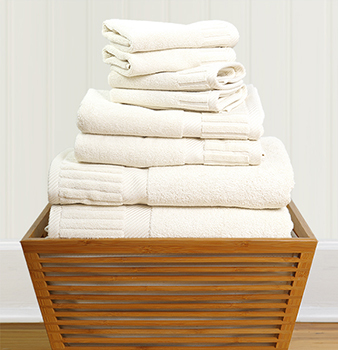 Pure Spa Direct has a great selection of towels from a variety of manufactures at a variety of price points. Take a look and change out your nasty towels today... think of it as a New Year's Resolution for your business!